Thanks to an unseasonably warm fall, my garden is hanging in there. I’m still getting some tomatoes, and I’m holding out hope that my brussels sprouts will actually have time to mature this year, instead of getting allllmost there and then getting killed off in an early morning frost. And my herbs are definitely still going strong. Herbs usually do. They’re one of the last things to go for the winter in my garden, and I still have a ton of them. So I was glad to be invited to a Whole Foods workshop, put on by Slow Food Denver, to show me how to make herb salts. The salts are good for so many things. Seasoning on meat. Or eggs. Or almost anywhere you’d normally use salt for flavoring — try herb salts for a little different flavor. I like the idea of making up a bunch of batches, then putting them in jars with cute little tags and giving them away to neighbors and friends. It’s a much nicer way to celebrate your garden harvest than sneaking onto their porches in the middle of the night and depositing bags of zucchini you can’t otherwise get rid of. Remove all leaves from your herb of choice. 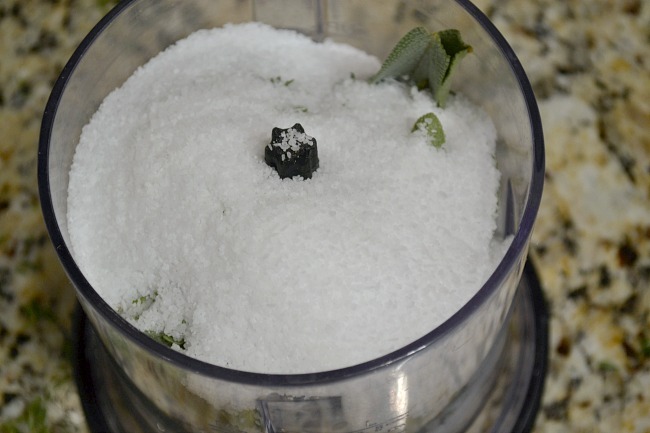 In a food processor, add herbs and salt and pulse until the mixture is the texture of coarse sand. If you intend to use herbs in the next 48 hours, you can transfer to an airtight container and refrigerate until you use them. If you want herb salts to last longer, spread on a sheet pan and allow to cure for 3-7 days. Once the herbs have dried, transfer to clean, dry jars and store for use. They will last from 6 months to a year. 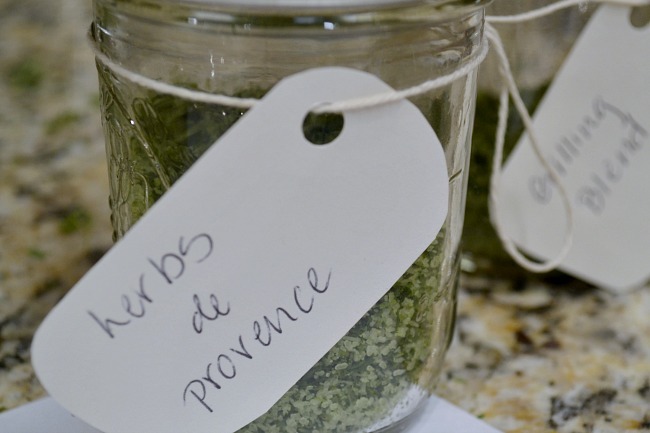 Herbs de Provence: we combined equal parts thyme, savory, oregano, lavender flowers, rosemary, and marjoram. Then combine these herbs with salt, following instructions above. Grilling Blend: Combine sage, rosemary, thyme, fennel seeds, and fresh black pepper. Combine these herbs with salt and follow above instructions. We put this blend on a steak before grilling and it was fantastic. Try it!